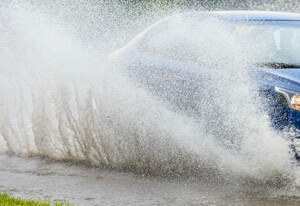 Hydroplaning is the term given for when a vehicle drives through a patch of water and loses the ability to steer. This is caused by the water seeping between the road surface and the tread of the vehicle tires, so that the tires are essentially floating on the surface. During bad weather conditions such as snow or rain, tire treads are designed to push excess water out and provide traction so that a vehicle continues traveling safely. When too much water builds up, this water cannot be moved out and a small sheet of water builds between the vehicle tires and road causing the vehicle to hydro/aquaplane. This can be a terrifying experience for most drivers as when this occurs at speed, it can only take a second until the vehicle spins out of control or is simply unable to stop in an emergency stopping situation. Have you been involved in an accident when a vehicle that was hydroplaning hit your vehicle? Do you know that if you or a loved one has been injured in a hydroplaning accident caused by a negligent driver, the victim may be entitled to compensation for property damage, medical expenses, lost wages, and more? At the law offices of Harbin & Burnett, we have detailed knowledge of the traffic laws in South Carolina and can help fight for financial compensation that you may be entitled to. Don't delay. Fill out the FREE CASE EVALUATION form to your right for a no-cost, no-obligation review of your hydroplaning accident claim by one a knowledgeable car accident lawyer its completely confidential. Although manuals and defensive driving courses can help drivers become more acquainted with common road hazards, it is important to know what steps to take to avoid being involved in a hydroplaning accident. Keep your vehicle well-maintained including replacing worn tires, maintaining adequate tire pressure, replacing worn brake pads, and more. Slow down during bad weather conditions, particularly around curves. Keep enough distance between your vehicle and the one in front of you, especially during adverse weather conditions. If you need to brake during rainy conditions, do so lightly. Slamming on the brakes could cause the car to skid. Know if your vehicle has an anti-lock brake system (ABS) or not. If your vehicle hydroplanes slowly ease your foot off the gas to decrease your speed. It is best to steer the vehicle away from other motorists if possible. Once the vehicle has slowed brake lightly until the vehicle comes to a stop. An individual may need to pump the brakes once the vehicles speed has slowed, however those with ABS will not need to do so as the system does it on its own. If you see a vehicle hydroplaning try to move your own vehicle away from them as safely as possible as it could prevent an accident. Staying calm is very important as panicking can only worsen the situation and possibly lead to an accident. If you or a loved one is seeking legal counsel after being the victim of a hydroplaning accident, our lawyers are here to help. We understand how frightening hydroplaning accidents can be as most of them can occur in an instant. At the law offices of Harbin & Burnett, our lawyers are committed to helping accident injury victims fight for their right to fair and just compensation. Our lawyers are experienced in handling car accident claims and can help to guide you and your loved ones through the entire litigation process. To learn more about how we may be able to help you with your hydroplaning accident claim, contact us at 1(888)821-0247. Your initial case consultation is of no-obligation and 100% FREE. If you would prefer to contact us online, simply fill out the FREE CASE EVALUATION form at the top right-hand corner of this page your information will remain confidential.